Photo by Tavia Redburn Photography. 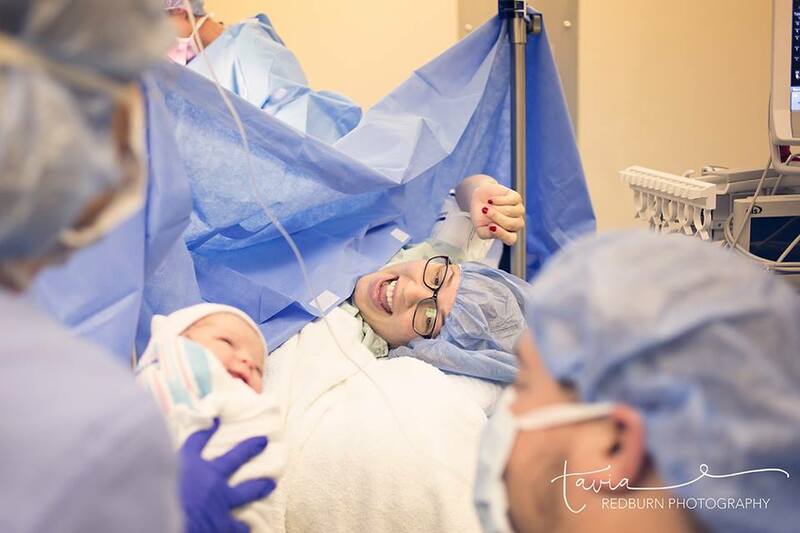 Whether your cesarean was planned from the beginning or a complete surprise, the recovery is something you'll need to go through. Luckily, you'll have your new bundle of joy by your side, softening the pain and more difficult days a little. However, a C-section is still major surgery, and as with all major surgeries, recovery isn't exactly fun. That said, there are ways to speed up the recovery process and make it go a lot more smoothly. By knowing the right steps to take, you can help ensure all goes well in the weeks postpartum. Surgery leaves even the best of us feeling groggy and in pain. For this reason, walking is likely the very last thing you want to do. Still, walking is one of the necessary steps you must take before leaving the hospital. It's also beneficial during recovery because it helps get blood moving, reducing the likelihood of clots. For this reason, you will want to do a bit of walking around the house each day. With that said, I must point out that this walking should be kept to a minimum in the first few weeks. No strenuous exercise should occur until at east 6–8 weeks postpartum, and even then, a new mama should get permission from her doctor. Nutrition is hugely important when your body is working hard to recover. Besides, if you're breastfeeding, you're providing your baby with all of his or her nutrients. Therefore, you simply must eat well after having a C-section. Besides eating a well balanced diet that is full of fruits, veggies, and lean meats, you will also want to make sure that the foods you choose contain plenty of fiber. This will help prevent the post-cesarean gas and constipation that so often plagues new mamas. Additionally, plenty of protein, iron, and vitamin C are all musts in an after-surgery diet. These nutrients help your body rebuild muscle, recover from blood loss, and fight off infection. Finally, you will need to consume A LOT of water. In fact, I recommend drinking around a gallon a day. Your body needs water in order to function properly, and with a post-operative recovery on its plate—as well as the usual postpartum work—it's going to need as much water as it can get. During the months postpartum, be sure to continue taking your prenatal vitamin. Not only will this help baby get plenty of nutrients through your breastmilk, it will also help your body recover more quickly. Other supplements you may consider should include 1) a quality probiotic in order to restore order in your gut, as well as 2) zinc and magnesium, also for gut health. One key part of recovery is making sure your scar heals correctly and without infection. The best way to do this is by babying the area. Stick to showers in order to avoid submerging your scar, never scrub that area, and gently pat it dry after showering. Put aloe vera gel and vitamin E on the scar to reduce swelling and visibility, and keep it covered with a organic or free and clear maxi pad or some other sterile, soft covering for the first two weeks. Of course, you're going to feel some level of pain after a C-section. In order to reduce this pain, be sure to use the painkillers prescribed by the doctor. As you wean off the prescription drugs, slowly make the switch to over-the-counter options such as ibuprofen. Other options that can be used along with these painkillers include essential oil aromatherapy, arnica gel, cinnamon supplements, garlic supplements, coconut water, omega-3 fatty acids, hawthorn berry tea, and hibiscus tea. Using a combination of a few of these should have you feeling a bit better. Not every mama is happy to have had a cesarean. If you are upset by the way your birth went, be sure to address this right away rather than allowing it to fester. Having your placenta encapsulated and adding the capsules to your daily regimen can help keep your emotions under control, but this shouldn't be your only course of action. You will also want to find a way to express your disappointment, air your grievances, and allow yourself to wade through, make sense of, and understand the strong emotions you may be feeling. For many women, simply talking with their partner or a close family member or friend is enough. Others need a professional to help them sort through their emotions. Still others prefer to write, draw, or use some other form of creativity to express themselves and get through this difficult time. Find what works for you and go with it. As you're recovering, you're going to need plenty of help. While your family is sure to help out as much as they can, it isn't always enough. For this reason, it's a great idea to hire a postpartum doula. Doulas are knowledgeable when it comes to postpartum recovery and newborn care, and are immensely helpful in nearly all aspects of life after birth. Are you ready to hire a postpartum doula? I'd love to talk to you about your options. Please contact me today!